Chiba Jets (NBL) strengthened their roster with addition of 25-year old American forward DeQuan Jones (203-100kg-90, college: Miami, FL, agency: BDA Sports). He already started the season at Atlanta Hawks in the NBA. 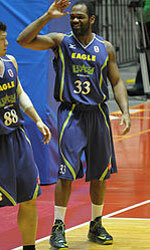 The last season Jones played at AV Cantu (Serie A) in Italian league. In 35 games he recorded 8.2ppg and 3.3rpg. Great season indeed as he was voted to Italian SerieA All-Star Game. 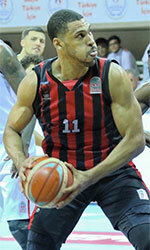 He also played 17 games in Eurocup where he averaged 8.2ppg, 4.3rpg, 1.0apg and 1.1spg. The previous (13-14) season Jones played at Bighorns in D-League. In 50 games he averaged 13.6ppg, 4.8rpg, 1.7apg and 1.3spg in 2013-14 season. In 12-13 season he played at the Magic in NBA. In 62 games he averaged 3.8ppg and 1.7rpg in 2012-13 season. Jones' team made it to the ACC Tournament Semifinals in 2010. He has played also professionally in NBA (Orlando Magic). Jones attended University of Miami, Florida until 2012 and it is his fourth season in pro basketball. The scouts decsribe him following way: A powerful player who can spend time in both the forward positions. He can beat any opponent with his great first pass towards the rim.